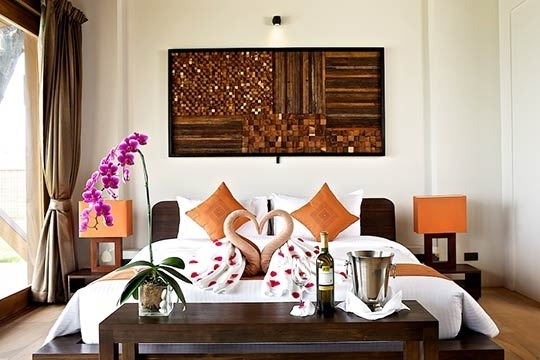 Bold, bright and brand new (2011), Baan Hinta and its near-twin and next door neighbour Ban Hinyai, take their names from Koh Samui’s folkloric (and somewhat suggestive) grandfather (Hin Ta) and grandmother (Hin Yai) rock formations, which lie a short distance away. 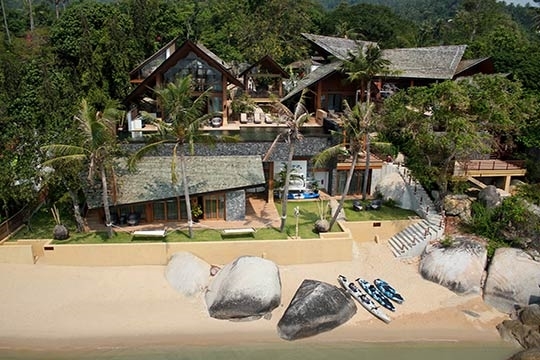 Similar huge granite boulders are strewn across the hillside above the secluded beach where the villa lies, adding a unique dimension to Baan Hinta’s exteriors and interiors. And the sparkling ocean is omnipresent. 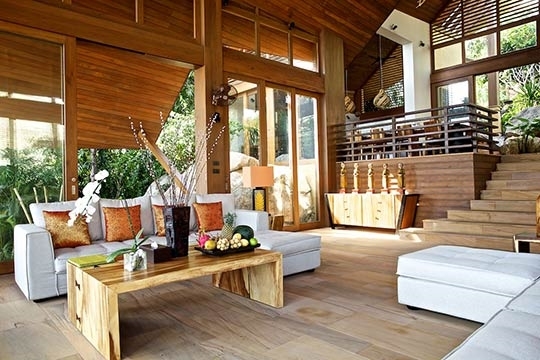 The villa’s capacious yet cosy design blends beautifully with its natural surroundings and makes the most of the island's tropical climate: softly toned sandstone floors and walls of sliding glass lie below lofty timber ceilings and sweeping cedar-wood roofs. 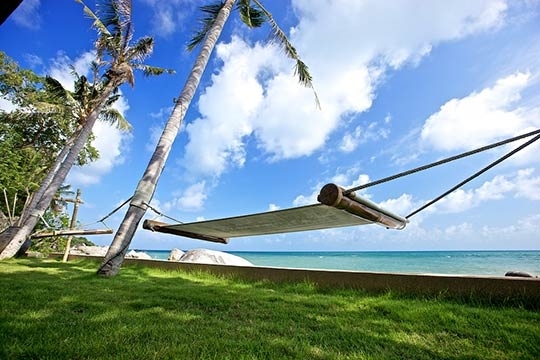 Despite being close to Lamai and a range of tourist attractions, Baan Hinta’s location is very private allowing guests to drift easily between the villa's multi levels, each of which offers a choice of ocean-view spaces to relax and indulge in tropical holiday pleasures. 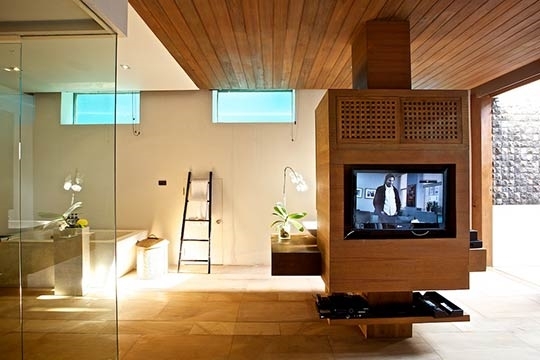 Quality furnishings ensure five-star comfort, complemented by contemporary amenities such as flat-screen TVs with satellite channels, DVD players, iPod docks, brand name kitchen appliances and a 120-inch projector screen on the pool deck for alfresco movie nights. 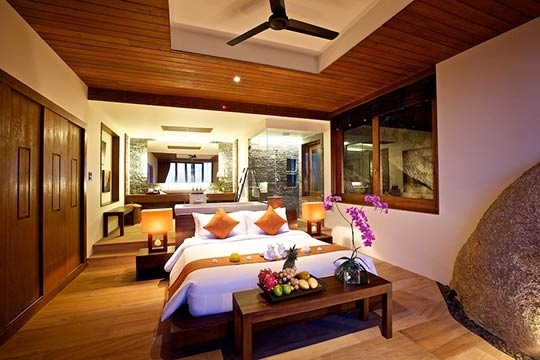 The villa’s four guest bedrooms (all with ensuite bathrooms) are equally well appointed and the generous master suite luxuriously encompasses the hillside’s dramatic rock formations, further adding to the villa's natural elegance. 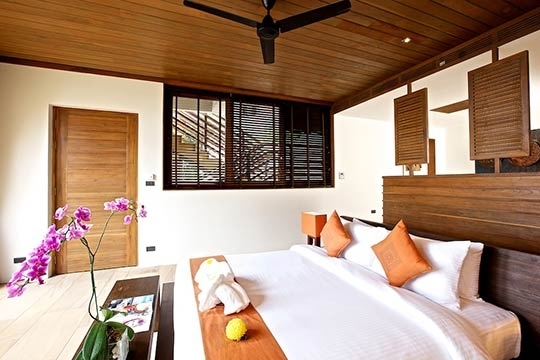 Although its steeply sloping location and multi-level layout make Baan Hinta less than ideal for toddlers or those with mobility issues, there’s a playful element at the villa which will certainly appeal to older children. A good selection of water sports equipment means guests can learn to windsurf right from the beach in front of the villa, or even explore the coastline on a jet-ski. 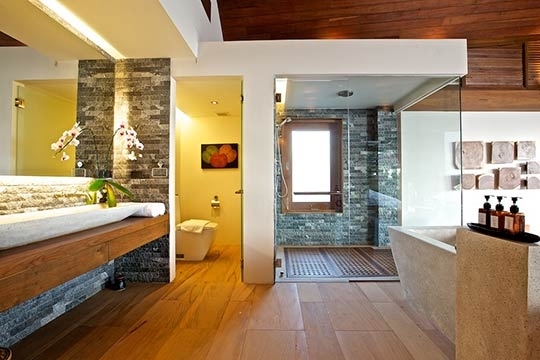 Kids will also love the bedroom window that looks straight into the watery depths of the swimming pool. 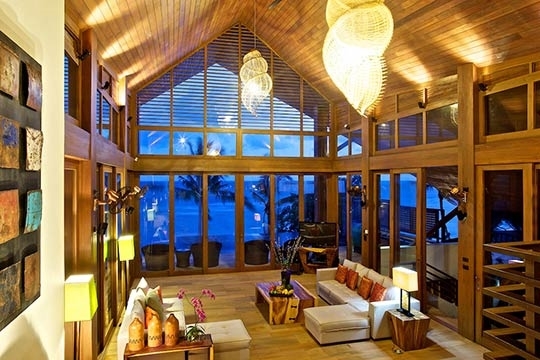 The villa manager is always on call and happy to help organise activities and trips. With advance notice, larger functions, parties and weddings for up to 50 guests can also be arranged. Breakfast is included in the rate and the chef prepares a range of dishes from a fixed price menu. Alternatively, groceries can be purchased for those wishing to self-cater, and a barbecue on the pool deck beckons for relaxed evenings under the tropical night sky. 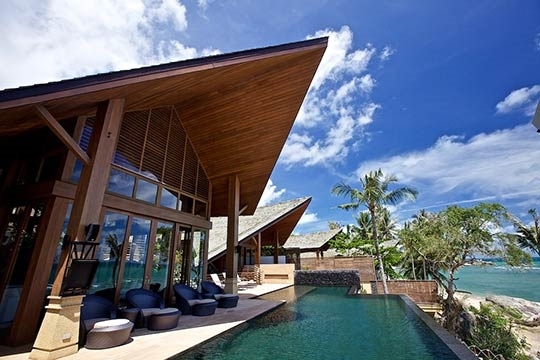 An architectural masterpiece on a secluded stretch of tropical coastline. 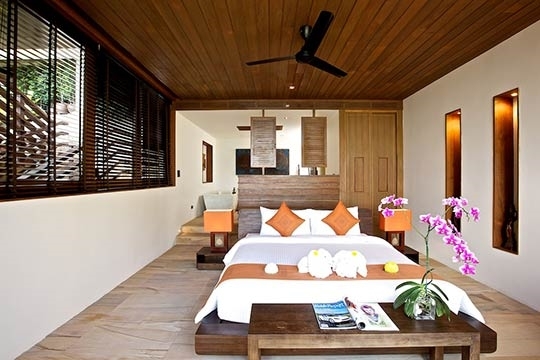 Baan Hinta is located three kilometres south of the busy tourist town of Lamai. 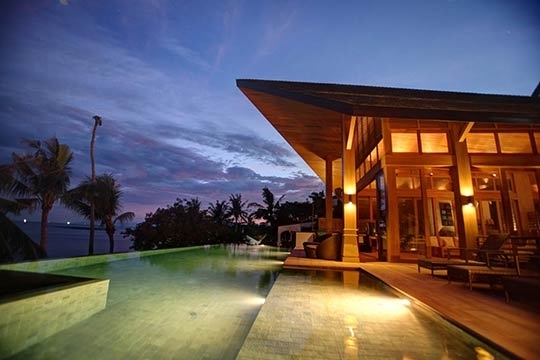 The closest restaurant is Mango Village, directly next door, which delivers freshly cooked Italian dishes to the villa. If you turn left onto the road you soon reach Sabinglae, one of the island’s best-known local seafood restaurants, while Rocky’s, renowned for its fine international cuisine is only slightly further along in the same direction. 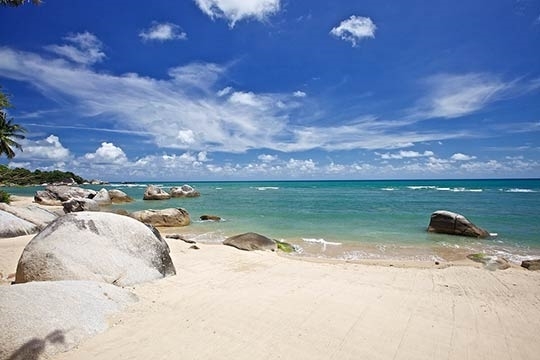 The much visited Hin Ta and Hin Yai (grandfather and grandmother) rocks are a short drive away from the villa, as are many of the islands tourist attractions including elephant trekking, temples and a whole range of spa and wellness options including yoga and Thai massage. Entering the villa’s lofty and bright split-level living and dining space, you are met with spectacular views over the pool to the glistening sea beyond. On the upper level, meals are served at a table formed from an enormous piece of beautifully carved local wood seating up to 14 guests. Adjacent, the kitchen is home to a selection of top-of-the-range kitchen appliances. From the dining area, sandstone steps lead down to the lounge where floor-to-ceiling glass doors open out to the pool deck and a pair of large L-shaped sofas make a delightful place to relax, read or enjoy a little distraction on the home entertainment system, which includes Apple TV and XBox. Outside, guests can relax on comfortable sun loungers on the deck, swim laps in the generous pool and, come nightfall, watch movies on the 120-inch projector screen. 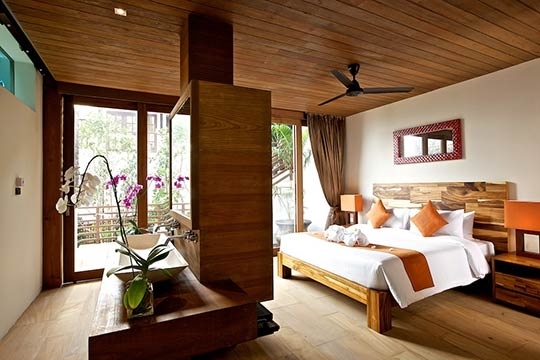 All five bedrooms at Baan Hinta are air conditioned and feature king-size beds, flat-screen TVs with satellite channels and iPod docks (plus a DVD player in the master suite). 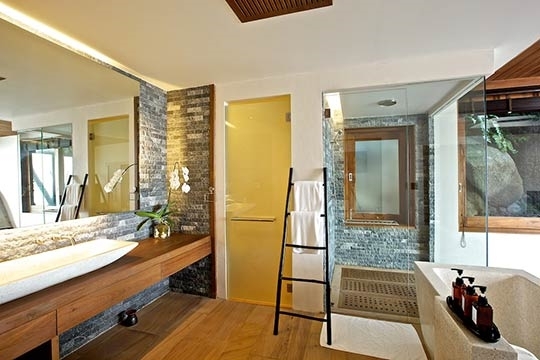 The first guest bedroom is situated on the upper level with dramatic sea views from its private balcony and a luxurious ensuite bathroom featuring an extra-large rain shower and terrazzo bath tub. The middle floor houses two more comfortable guest rooms, equally well furnished and of a similar style and design to the first but with a shared balcony. 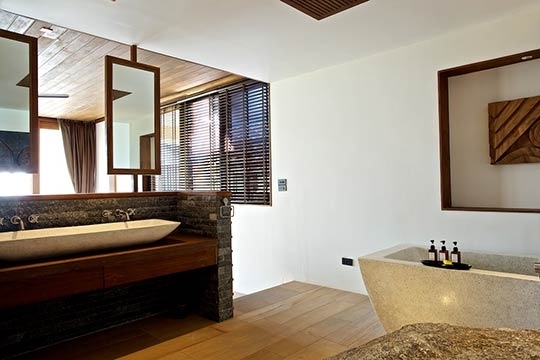 A cut-through leads to the fourth guest room (known as the children’s room), which boasts a huge window that looks straight into the waters of swimming pool positioned above. 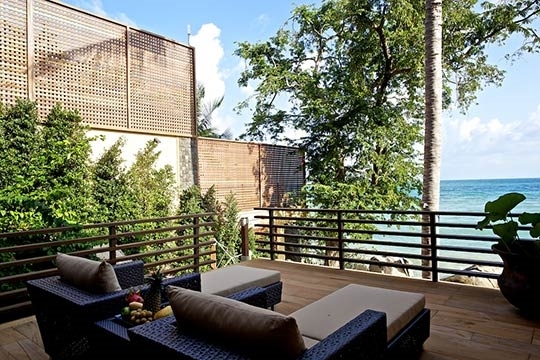 On the lowermost level of the villa – fronted by a small garden where two canvas hammocks offer the perfect spot for an afternoon snooze or a tender moment under the stars – is the master suite. 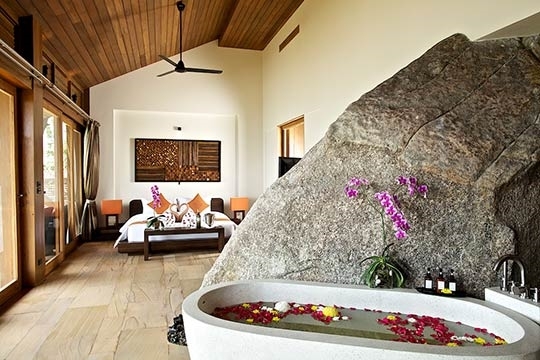 With floor-to-ceiling windows looking directly out to the ocean, this is a romantic and intimate suite with luxurious features built around the granite rock formations. A short set of steps lead down from here to the soft sandy beach where loungers await for lazy days of sun worship. 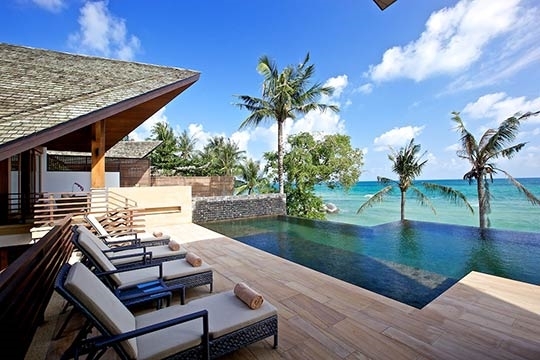 5 bedroom villa located in Lamai, Koh Samui. Ideal for Beachfront, Body and soul, Bring the relatives, Executive escape, Kid friendly, Gastronomic delights, Going for golf, Fair share for groups, Party pads, Room with a view, Perfect for weddings.